American music legend Ray Charles Robinson was born in 1930 in Georgia. 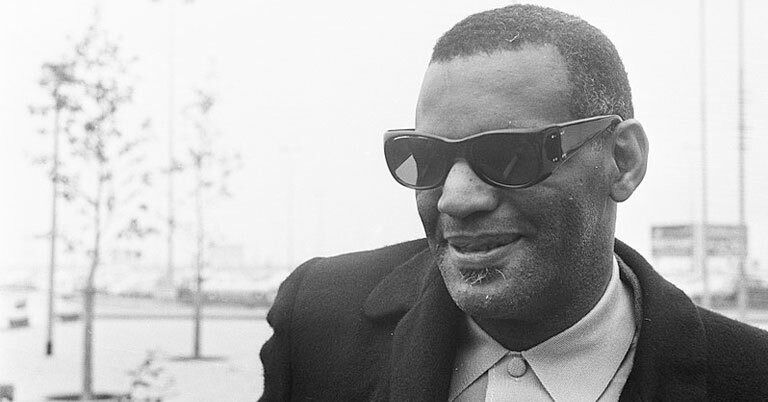 Best known as Ray Charles, or simply Brother Ray, or The Genius to his friends, he enjoyed a successful music career, despite going blind at the age of seven. Father of the 1950s soul music scene, Ray possessed a unique and captivating sound combining blues, rhythm, gospel, country and pop. Although Ray was influenced by the likes of Nat King Cole, Art Tatum and Louis Armstrong, his music style was very individual in nature, earning him great respect from fans and fellow musicians alike. Ray spawned over 80 hit songs over the years, his first big release entitled Mess Around in 1953. His first number one hit came in 1955, with I Got A Woman. In 1962, I Can’t Stop Loving You peaked at the top of the UK and US charts for five weeks, making it one of his most famous tracks. Georgia On My Mind was also a chart-topping hit for Ray in 1960, although the song was penned in 1930. It went on to become the state song of Georgia. Other notable tracks from Brother Ray include What’d I Say, Unchain My Heart and, of course, Hit the Road Jack. Although Hit the Road Jack was written by Percy Mayfield and first recorded in 1960, it was Ray Charles who made it famous with his infectious version in 1961 – it claimed the number one spot for two weeks. Hit the Road Jack was the second of Ray’s three number ones, and it was his first to top both the mainstream and R&B charts simultaneously. Ray performed this rhythm and blues classic with his one-time lover Margie Hendrix from The Raelettes – his group of backing singers. What makes Hit the Road Jack so likeable even to this day is its catchy melody and simple tune. It manages to successfully fuse country swing with rock-a-billy, blues, tight horn sections, walking bass lines and a touch of a novelty. There’s nothing complicated about the lyrics and their meaning, which refer to a woman throwing out a man who is no good and has no money – much as he protests that he’ll be back on his feet one day! The phrase ‘hit the road Jack’ is frequently used to this day to mean get on your way or get moving immediately. Many hockey teams belt out the first few lines of the song when a player is sent to the penalty box. The song also features in the 1989 film, The Dream Team, and was re-recorded by Ray in the 1980s for a TV commercial. Ray achieved widespread recognition for his musical talents and abilities, and the fact that he was able to enjoy such success despite being blind made him an inspirational figure for those with, and without, disabilities. After Hit the Road Jack, Ray won the 1961 Grammy for Best Male Rhythm and Blues Recording. The song has also been named in the top 500 Greatest Songs of All Time, according to the Rolling Stone magazine. Ray has also been named in the top ten of the 100 Greatest Artists and Singers of All Time. He achieved a star on the Hollywood Walk of Fame in 1981 and was the first inductee to the Rock & Roll Hall of Fame in 1986. A Grammy Lifetime Achievement Award came his way in 1987, and in 1993 he was awarded the National Medal of Arts. In Ray’s hometown of Albany, a new plaza was named after him, complete with a bronze statue of the man himself sat at a piano. A biographical movie showcasing Ray’s personal and professional life hit the screens in 2004, earning actor Jamie Foxx, who portrayed Ray, an Academy Award. If you like the idea of hitting the road without any fuss, why not consider hiring a vehicle for the weekend from H&H Van Hire? You’ll even get free coffee and cake thrown in!